Cloudy early followed by partly cloudy skies and gusty winds this afternoon. High 61F. Winds N at 20 to 30 mph. Higher wind gusts possible..
Missouri Farmer Today checks in with farmers throughout the state for our annual update on soil conditions and planting progress. MONTGOMERY CITY, Mo. 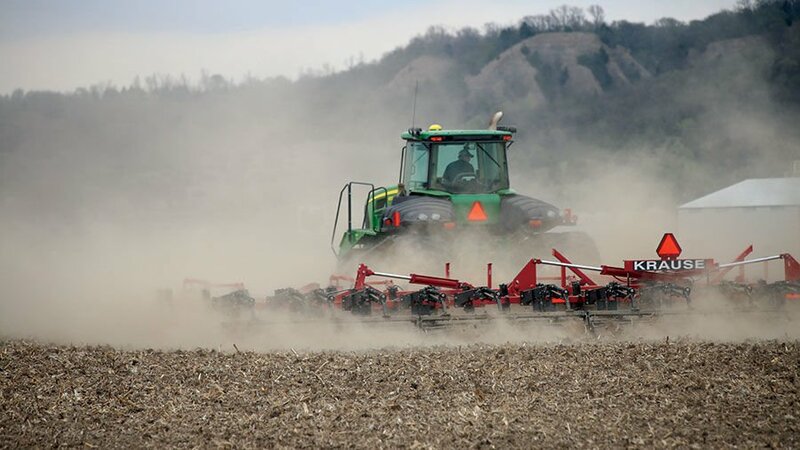 — A few clouds drifted across the Montgomery County sky, but otherwise conditions were ideal as Roger Brakensiek planted a field in East Central Missouri. It was good weather for catching up after a cold start to spring delayed planting. Corn planting, pastures and trees all seemed to be behind schedule. The weather delayed corn planting enough that corn and soybeans started going in the ground at nearly the same time. It was maybe a bit of an early start for soybeans, but Brakensiek said farmers were in a planting mood. As Brakensiek planted, tractors in fields in all directions were also at work. The weeks of waiting had given way to busy field activity across the county and region. The soil temperatures were finally rising and the soil conditions were good for planting. “It’s working pretty good,” Brakensiek said. As the afternoon wore on, he kept planting, gradually working across the field as the sun worked across the sky, poking in and out between the clouds. More sunshine and even warmer temperatures were in the forecast, which meant even more field progress should be coming. Brakensiek said the forecast could change, but for now it was showing cause for optimism. “I think it’s supposed to be good,” he said. WATSON, Mo. — Dust engulfed Reed Martin as he field cultivated near here May 1. A day later, nearly an inch of rain knocked down the dust rolling off the dry river bottom soil and gravel roads. “We needed that rain,” he said May 3. Martin, who farms in Atchison County, said he finished planting corn the last week of April. After that, the Northwest Missouri farmer planted beans. He noted the cold and wet spring delayed planting progress. Windy conditions may have kept some sprayers out of the fields, but Martin said he followed up corn planting with pre-emergence spraying. OLD FRANKLIN, Mo. — On a sunny late-April day in central Missouri, Howard County farmer Bryan Kircher was stirring up dust in the Missouri River bottom. He drove his tractor back and forth, pulling a cultivator across the field that sprawled out on the north side of the river, across the bridge from Boonville. It had been unusually cold during late March and the first half of April. The second half of April saw temperatures slowly, unevenly climbing higher at last in this area. “We haven’t gotten that far yet,” Kircher said on April 26. Kircher, who farms with his dad, growing corn and soybeans, said they were just getting started. It was a little later start than usual. “We usually start about April 15,” he said. Kircher added that most years they plant sweet corn in mid-April as well, so they can have it ready for the Fourth of July. He described the spring so far as “really dry and cold.” Even as things were warming up, Kircher said the soil temperatures were less than ideal. But it was good enough to get started. “Honestly the ground’s probably a little cool,” he said. Kircher kept working up the bottom ground soil, turning it up and exposing it to the warm sun. Weather is the big factor farmers can’t control. “Can’t do anything about it,” Kircher said with a smile. CONCORDIA, Mo. — Late April was a busy time for Lafayette County farmer Darren Hull. After a cold, wet start to spring delayed planting, some warmer weather provided a window to get some planting done. Soil temperatures were finally climbing up. Still, the usual spring showers were limiting the planting in West Central Missouri to certain windows when conditions were dry enough. Hull, who grows corn, soybeans and wheat, and raises cattle, said planting got started on April 20. He was able to put in some corn before another shower passed through. “I got a couple of acres of corn planted ahead of the rain,” Hull said April 26. “We got four-tenths of an inch yesterday. The delay should be brief, he said. “It’ll keep us out of the field today, but tomorrow should be a pretty good, dry day,” he said. Hull said it was a cooler rain, but it didn’t hurt the soil temperatures too much. The pauses in field activity fit with some of the other activities on the farm. Hull’s wife gave birth to another child for the couple in April. He was also preparing for AI day for his cattle in late April. Things can happen fast on the farm, and even warmer weather was on the way, bringing with it a lot of opportunities for fieldwork and pushing away the memories of cold weather and April snows. “It’s really changing fast,” Hull said. THOMPSON, Mo. — On April 24, Chad Baldwin was at work planting a field in Audrain County in northeast Missouri. “We started (planting) the first of the week,” he said, planting corn and soybeans at the same time. Cold, wet weather had kept farmers out of the field for the early weeks of spring, but at last warmer, drier weather had arrived. After a slow start, there was a lot of activity in the fields. “The corn’s probably a little behind,” Baldwin said. The weather had turned from cold and wet to warm and dry, and the soil was drying quickly. According to the U.S. Drought Monitor map dated April 26, 15.16 percent of Missouri, mostly in the northern part of the state, was in drought conditions; 29.3 percent of the state was either in drought or abnormally dry. FOREST GREEN, Mo. — On a warm spring day in Chariton County, Mitchell Rice was cultivating. The earth was working up nicely and the late-April breeze pushed the aroma of freshly worked ground across the field. At last, spring was in the air. Rice stopped to check his tractor and cultivator. Corn planting was wrapping up after a busy week. Cold weather delayed the start of planting season. Despite the progress, planting was still lagging behind. “We’re about two weeks behind,” Rice said. Still, the clear, warm weather was allowing for a lot of catching up. “It’s working as good as it ever has,” he said. Rice, who grows corn and soybeans in North Central Missouri, was feeling positive heading into another growing year. 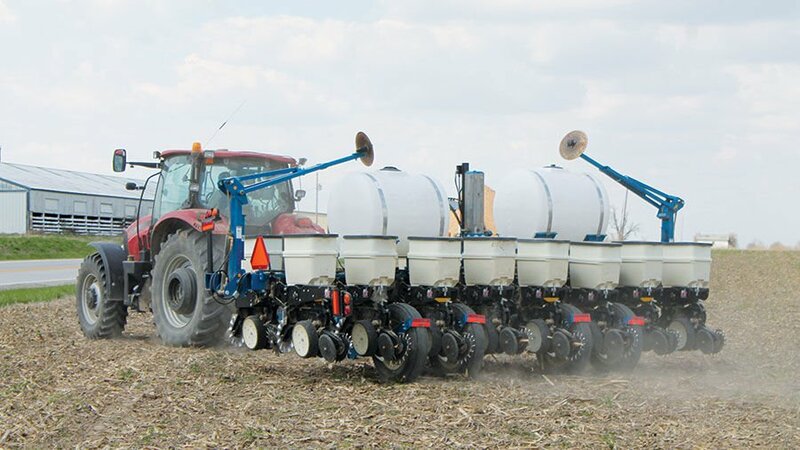 According to the USDA’s Missouri Crop Progress and Condition report released April 30, Missouri’s corn planting progressed 36 percent during the last week of the month, up to 52 percent complete. That was about in line with the five-year average of 51 percent complete. Missouri’s soybean crop was 5 percent planted in the April 30 report.